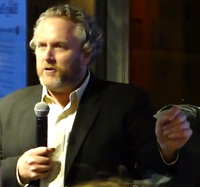 Washington, DC -- The National Bloggers Club, a new non-profit providing a loose association for free market bloggers, has officially announced a grant program for young citizen journalists in honor of Andrew Breitbart’s legacy, the Breitbart Scholarship Fund. The fund has been set up in conjunction with a website, RememberBreitbart.com, dedicated to showcasing Andrew’s fans and showcasing his work. Visitors of the website will be able to donate to the fund, apply for grants and submit their own videos to a library of fans memorializing Breitbart. Prior to his death, Breitbart attended a National Bloggers Club event, Blog Bash at CPAC. There he was given the “Changing the Narrative” award for his work exposing the Anthony Weiner Twitter scandal. Shortly after, Breitbart had indicated he would join the Board of Directors for the National Bloggers Club. This wasn’t Breitbart’s first Blog Bash event. He had been a supporter for over 2 years. “Not in a million years did I ever imagine that we would lose Andrew just weeks after I handed him the only award -- from what I’m told -- that he would receive recognizing his work. I knew we wanted to do something special to honor this man and make him a legacy, so when I was approached about having the National Bloggers Club ‘do something’ in Andrew's memory, we jumped.” said National Bloggers Club President Ali A. Akbar. In the weeks following his passing bloggers and activists have held memorial events across the country including Washington, DC, New York, Michigan and Texas “to honor his legacy and renew the commitment to fight the good fight” according to Tea Party Express Chairman and National Bloggers Club Advisory Board Member Amy Kremer. Anyone interested in making a donation to the Breitbart Scholarship Fund can go to www.RememberBreitbart.com. All grants will be reviewed by a board overseen by Andrew’s friends, former colleagues and other bloggers. National Bloggers Club is a new 501(c)(3) founded by top new media operatives, bloggers and journalists as a loose association of bloggers who are for free enterprise and limited government and to advocate on bloggers behalf.